This blog post was first published on August 26 2012, and revised and re-posted on May 18 2016. Today is the last day of the Darwin Festival, a Top End cultural extravaganza of art, music, dance, comedy, film, theatre, cabaret, and festivities. The city of Darwin is known for its laid-back lifestyle and unique multicultural mix, with people of over fifty nationalities living side-by-side and intermingling. If you attended the festival, you could have learnt how to make Chinese dumplings, watched an Aboriginal drag queen, got a make-over at an African beauty salon staffed by children, picnicked with teddy-bears, been seduced at a Bollywood burlesque show, swum at a pool party, gone to a Rio-style cabaret, and attended a rock concert in someone’s back yard. Darwin is the capital of the Northern Territory, the smallest Australian capital, and the most northerly of our capital cities. It looks towards Asia, across the Timor Sea, and is geographically closer to the capital cities of five other countries than it is to the capital of its own. It has the highest Indigenous population of any capital city, with perhaps 10% of the city’s residents being Aboriginal, and has a significant Asian population from China, Indonesia, Vietnam and the Philippines. 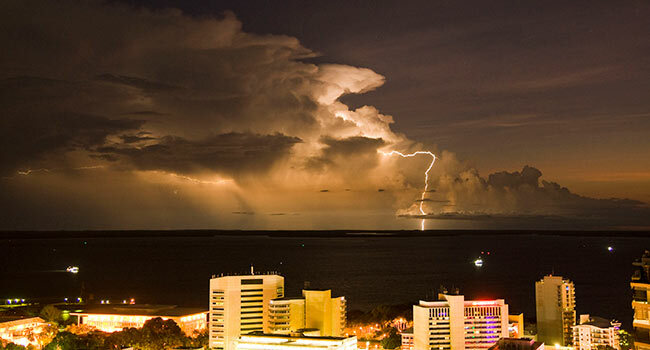 Darwin swelters in tropical heat year-round, and is one of the most lightning-prone areas of the world. Having been bombed by the Japanese in World War II, and flattened by Cyclone Tracey in 1974, it’s been rebuilt twice and looks very modern. The first British person to see Darwin harbour was Lieutenant John Stokes in 1839, who was on HMS Beagle. The ship’s captain, John Wickham, named the port after naturalist Charles Darwin, who had sailed with them on the Beagle‘s previous voyage. Charles Darwin had spent almost five years sailing the world on the Beagle, and it was his adventure of a lifetime. He accumulated enough specimens to make his reputation and keep him occupied for years, not to mention surviving an earthquake and discovering a new species of dolphin. In Australia, he found the platypus and kangaroo-rat so odd that it seemed to him two distinct Creators must have been at work making life on earth – a radical thought for someone who had just finished studying to become a clergyman (not surprisingly, he went with a scientific career instead). Darwin returned to England a celebrity, but what he didn’t do on his trip was discover evolution, for that idea was decades old, and familiar to Darwin’s own grandfather, Erasmus. What he did (when he got home) was come up with natural selection as a means to help explain the mechanism behind evolutionary theory. His masterwork On the Origin of Species proved a bestseller, but Darwin avoided using the word evolution in case it proved too controversial, and only vaguely alluded to humans being part of the evolutionary framework. However, it resonated with both the scientific community and popular imagination, inspired the ideas of others, and made evolutionary theory an established part of the modern world-view. The English surname Darwin has two separate meanings. Originally it was from the Anglo-Saxon personal name Deorwine, meaning “dear friend”. Later it was taken from the town of Darwen, which stands on the river of that name in Lancashire. The river’s original name seems to have been Darwent, from the British meaning “valley thickly grown with oaks”. The surname Darwin is most often found in the north of England, suggesting the origin from the town is more common. Darwin has been used as a personal name since at least the 18th century, and in England was first associated with Lincolnshire. Charles Darwin was descended from the Darwins of Lincolnshire, and he inherited the family estate there, which came down to him through his grandfather. Even in the 19th century, a link with Lincolnshire continued, but the name became more common in the Midlands, a focal point for the Darwin family as it married into the Wedgwood family, famous for its pottery. So many Darwins went on to do interesting and worthy things that it isn’t possible to say everyone called Darwin had their name inspired by Charles Darwin – it might well have been another admired family member. The name Darwin has always been more common in the United States, where it was first associated with the New England area. Although some of the towns and natural features in America called Darwin are named in honour of Charles Darwin, unlike in other countries, several are named are local people whose first name was Darwin. The name Darwin has been on and off the US Top 1000 since the 19th century, with a long continuous stretch from the early 20th century until the mid 1990s. It peaked in 1938 at #279. It has been on the Top 1000 again since 2001; it is currently #876 and generally fairly stable. In the UK, the name Darwin has been generally rising, and 27 baby boys were given the name Darwin in 2014. In Australia, Darwin is extremely rare as a first name, and only slightly more common as a middle name. Although it can be found a handful of times in records, most Australians probably think of it as a “modern” name. While Adelaide and Sydney are accepted as baby names here, I suspect for many people Darwin seems more of a “place” name than a “person” name. However, Darwin is genuinely Australian, and honours a wonderful namesake – a great thinker and humanitarian scientist who changed our world forever. Darwin received a decent approval rating of 68%. 26% of people thought the name was okay, and 14% hated it.